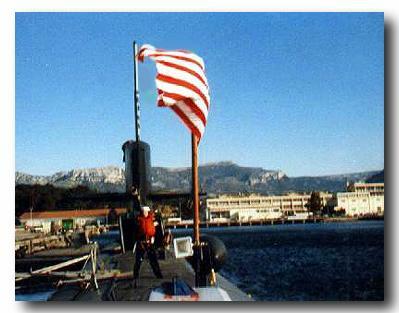 At the French Naval Base in Toulon, near the Riviera. It was a beautiful spring day in April 1984. This photo was taken just before we were to do a "security swim," in which we'd don scuba gear and dive to inspect the boat, stem to stern, to ensure there were no bombs planted aboard. Quite a hazardous duty, since we'd have a real chance of being pinned by a seawater suction. And as I remember it, the reactor was critical at the time, and there was no shielding around the hull, and yet we were supposed to inch-by-inch hand-over-hand the hull. The fact that I was able to produce children sometimes amazes me. If the countryside looks pristine above the water, that reality ended at the water's surface. The water was some of the dirtiest bay water I'd ever seen, and I'd dived in the bottom of Groton's Thames River at night. I didn't so much inspect the hull as feel it. I was exhausted when we finished.